Enquire or book a trip along Cái Bè - Cần Thơ - Châu Đốc. Lunch while en route. Rest on the deck. The Bassac slips into the Chợ Lách canal, in the middle of the hustle and bustle of the river traffic, between markets and churches, a unique opportunity for a glimpse of the very varied life on the banks as well as on the water. By mid-afternoon, the Bassac casts anchor for a visit on shore: past the first tree line, quiet discovery of the peaceful life in the delta's countryside, of rice fields, fruit trees and the welcoming inhabitants, or, at your option, short cycling tour of the surrounding area. Boarding back, complimentary drink as a welcome back on board. Rest on the deck enjoying the sunset. The crew will serve dinner while the Bassac is cruising Mang Thit river. The Bassac sets anchor just downstream from Tra On for the night. The boat departs at 06:00, as the ship passes by Tra On. The ship then departs towards Can Tho. The breakfast is available at 7:00. Arrival in Cần Thơ, transfer onto a local boat to visit the Cai Rang floating market, then a noodle factory and return to the Ninh Kieu pier by mid-morning. Boarding back, welcome drink and departure towards upstream river Bassac. Lunch is served on board while en route. Rest on the deck before the night. 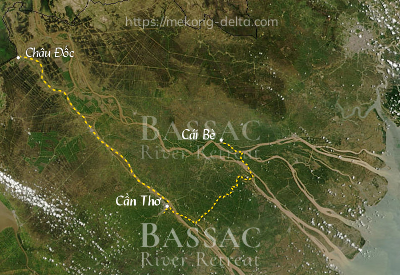 The Bassac drops anchor upstream of Long Xuyen for the night. Breakfast is served from 6:30 AM, as the Bassac is on its way upstream the river towards Châu Đốc. Upon arrival to Chau Doc, check-out and transfer onto a local boat for the visit of a village of the Muslim Cham minority, then final disembarkment.